Tune Up: A properly tuned engine can improve fuel economy about 4 percent, according to the U.S. Environmental Protection Agency. Pump Up: Properly inflated tires improve gas mileage by up to 3.3 percent. Properly inflated tires are safer and last longer. Under-inflated tires can lower fuel economy by 0.3 percent for every one pound-per-square-inch drop in the pressure of all four tires. Unpack: Carrying unneeded cargo makes your vehicle work harder and use more gas. The EPA says an extra 100 pounds reduces fuel economy up to 2 percent – even more in smaller vehicles. Avoid Idling: A car gets 0 mpg when the engine is idling. Unclog: Older cars without fuel injection and computer-controlled technology can lose 14 percent of their fuel economy because of a dirt-clogged air filter, which also can damage the engine. A clean air filter improves acceleration. Plan your Trips: Taking your kids to soccer or swim classes? Grocery shopping? Plan logical routes and timing to avoid heavy periods of traffic congestion. Cap Check: A missing or poorly fitting gas cap can reduce fuel economy by 1 to 2 percent. OnStar Diagnostics: OnStar provides regular Diagnostics on a monthly and now on a remote immediate basis (with the OnStar App). You have an accurate reading of all of the technical information you need to take simple pre-cautions to reduce the fuel consumption of your car. Always plan ahead the routes you will go for your destination. Search and take the route with less resistance, fewer stoplights, less traffic, and lower speed limits. Replace or tighten your gas caps because any broken or weak seals will allow fuel to evaporate through it, which will decrease fuel economy. Widening your knowledge would be a great advantage for you to have a a good maintenance on your car. This could give a guarantee that all things would be functioning properly. Thank you for sharing the information. thanks for the comment! we think so, too. 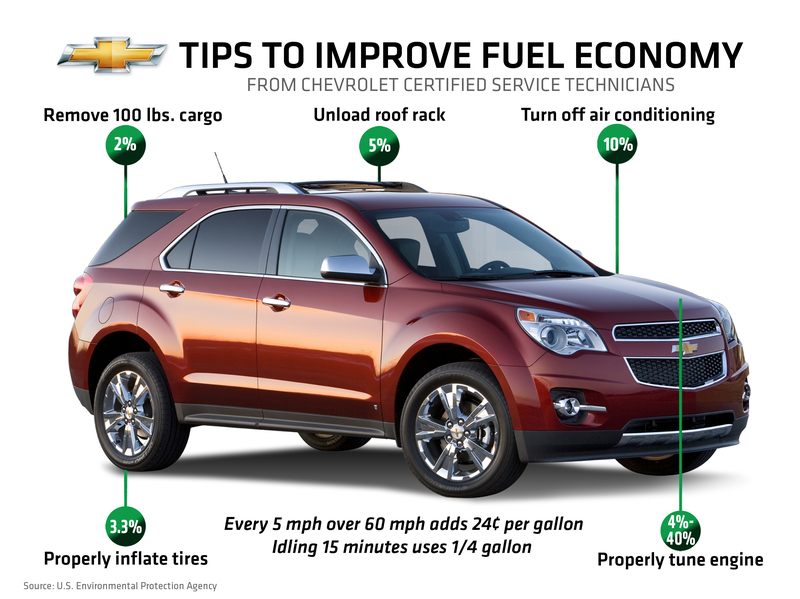 i just posted another article on fuel economy tips the other day.